Originally published in 1991, this title was the result of a symposium held at Harvard University. It presents some of the exciting interdisciplinary developments of the time that clarify how animals and people learn to behave adaptively in a rapidly changing environment. The contributors focus on aspects of how recognition learning, reinforcement learning, and motor learning interact to generate adaptive goal-oriented behaviours that can satisfy internal needs - an area of inquiry as important for understanding brain function as it is for designing new types of freely moving autonomous robots. Since the authors agree that a dynamic analysis of system interactions is needed to understand these challenging phenomena - and neural network models provide a natural framework for representing and analysing such interactions - all the articles either develop neural network models or provide biological constraints for guiding and testing their design. About the Editors. About the Contributors. Preface Part 1: Models of Classical Conditioning 1. Memory Function in Neural and Artificial Networks Daniel L. Alkon, Thomas P. Vogl, Kim T. Blackwell and David Tam 2. Empirically Derived Adaptive Elements and Networks Simulate Associative Learning Douglas A. Baxter, Dean V. Buonomano, Jennifer L. Raymond, David G. Cook, Frederick M. Kuenzi, Thomas J. Carew and John H. Byrne 3. Adaptive Synaptogenesis Can Complement Associative Potentiation/Depression William B. Levy and Costa M. Colbert 4. A Neural Network Architecture for Pavlovian Conditioning: Reinforcement, Attention, Forgetting, Timing Stephen Grossberg 5. Simulations of Conditioned Perseveration and Novelty Preference from Frontal Lobe Damage Daniel S. Levine and Paul S. Prueitt 6. Neural Dynamics and Hippocampal Modulation of Classical Conditioning Nestor A. Schmajuk and James J. DiCarlo 7. 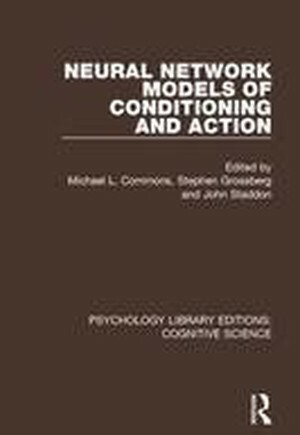 Implementing Connectionist Algorithms for Classical Conditioning in the Brain John W. Moore Part 2: Models of Instrumental Conditioning 8. Models of Acquisition and Preference Michael L. Commons, Eric W. Bing, Charla C. Griffy and Edward J. Trudeau 9. A Connectionist Model of Timing Russell M. Church and Hilary Broadbent 10. A Connectionist Approach to Conditional Discriminations: Learning, Short-Term Memory, and Attention William S. Maki and Adel M. Abunawass 11. On the Assignment-of-Credit Problem in Operant Learning John E. R. Staddon and Y. Zhang 12. Behavioral Diversity, Search and Stochastic Connectionist Systems Stephen Jose Hanson. Author Index. Subject Index.